Well the hot weather has not lasted in our part of the country, but today the sun is out and the birds are singing so we can’t or rather shouldn’t complain much. Here in Norfolk we are gearing up for the show of the year, that is, The Royal Norfolk Show, where everything that is good about this pocket of the countryside comes together in a very splendid, typically British way. We can enjoy what is essentially a trade show with some frilly bits on the side, like Norfolk Gin, (will there be free tasting I wonder?) independent bakers and caterers. Not forgetting of course all things agricultural. If you are regulars to our blog you will know that this year we have been too busy to even think about taking part in or indeed visiting the Royal Norfolk Show and will have to amuse ourselves by reading about the fun and frivolities in our local rag the “EDP”. Being busy is good of course and this particular blog serves to remind us that good business isn’t always about those big flashy products, because here at Just Lawnmowers of course we also sell a fantastic range of budget lawnmowers. And really, we don’t like to use “budget” as a “buzz” word because it implies a cheap product, something that will give you a quick fix but won’t last. Well that is not always the case and certainly not in our case. Our products are carefully chosen and priced to ensure you always get good value for your money. So, here we offer you our top ten budget (or if we can quote Top Gear “reasonably priced”!) lawnmowers of 2017. All of these products and more can be found at Just Lawnmowers. And more good news…our prices might seem cheap but they even include VAT and free delivery (1-2 days) now how’s that for a great deal?! Up first we have we have the Gardencare LM40P Petrol Lawn Mower. Priced here at just £187.95. 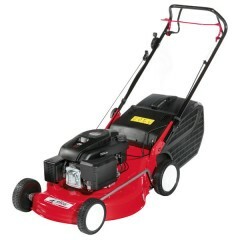 Ideally suited to small gardens (up to one third of an acre ideally) thanks to its compact 40cm / 16″ cutting width. The Briggs & Stratton 125cc engine will give those discerning gardeners around you something to be jealous of, and will give you years and years of efficient and trouble free gardening. Worth every penny, the Briggs & Stratton brand are known throughout the industry for their hard working and robust capabilities. The 55 litre grass box is generous, and the recoil start takes the hard work out of starting the petrol engine. The deck is steel and is as sturdy as it looks! Being hand pushed usually cuts the risk of too many bumps or scrapes, especially in small spaces. Gardencare is a tried and trusted brand and comes highly recommended by us, and this model is very popular for many reasons. Reasonably priced it just comes into our budget range, whilst offering features above and beyond its price tag. Buy the very popular Gardencare LM40P Petrol Lawn Mower from us here at Just Lawnmowers and get a Bottle of 4-stroke oil (0.6 litres or 1 litre depending on availability), and free delivery all for just £187.95 (RRP £210) – unbeatable value! 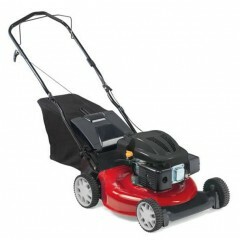 Our second contender is the very popular Hyundai HYM40P Petrol Lawn Mower. 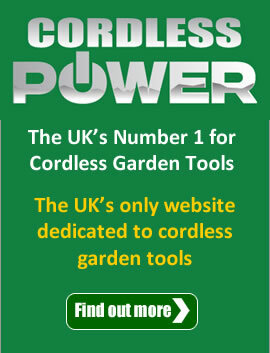 Being hand pushed together with a cutting width of 40cm / 16″ cutting width makes this ideal for small domestic gardens. Being hand pushed you can take your time navigating around garden obstacles and are less likely to bump or scrape your mower in tight spaces. It is really easy to start thanks to its recoil start, and has a grass box capacity of 40 litres, which is generous but not so big that you have trouble emptying it. The 4 stroke 99cc engine will give you years of trouble free mowing and to ease your mind further you can benefit from the Hyundai 3 year platinum warranty. You will notice on first use that this lawnmower’s low weight is a huge benefit and thanks to its compact design you will find it very easy to use. The handles fold down, which means when storage is at a premium you will have no problems finding a small space to store your lawnmower in. Buy the very popular Hyundai HYM40P Petrol Lawn Mower from us here at Just Lawnmowers and get a Bottle of 4-stroke oil (0.6 litres or 1 litre depending on availability), 3 year Hyundai Platinum Warranty and free delivery all for just £149 – unbeatable value! 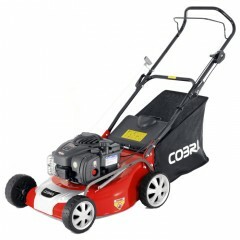 3rd on our list is the much loved Cobra M40C Petrol Lawn Mower. Priced very reasonably at just £159.99. Hand propelled and designed for use in small gardens you will quickly see that despite being petrol powered it is quiet and easy to use, even in small spaces. Hand propelled gives you greater flexibility as you negotiate those awkward garden structures and get up close and personal to walls and flower beds. A compact cutting width of 40cm /16″ still allows you to get the mowing finished in no time at all. The 50 litre grass box is generous enough to allow for just one trip to the compost heap in most cases. Easy to start and built to last, you can’t ask for much more for your money in our opinion. We love the Cobra brand, it always delivers on quality and value for money. Knowing exactly how much lawn you can mow for money is not an easy science, but we would say this Cobra could cope with about 600 square meters. The engine benefits from the latest in design technology and therefore offers optimal torque and efficiency. 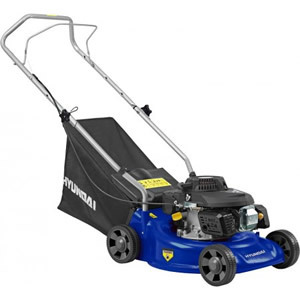 Buy this petrol lawn mower from us here at Just Lawnmowers and get a Bottle of Engine Oil + Free Express Delivery (Usually Next Day) all for just £159.99 (RRP £169.99) – unbeatable value, hurry up while stocks last of this popular model. Or for just £169.99 get this fantastic deal – Cobra M40C Petrol Lawn Mower + DELUXE Cover + Bottle Engine Oil + Free Express Delivery (Usually Next Day). Ok here we have the Mountfield SP414 Self-Propelled Petrol Lawn Mower, priced at £209 (RRP £219) with Free Express Delivery. 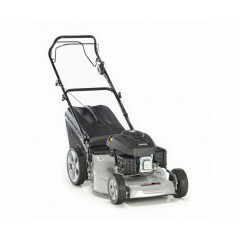 Ideal for smaller gardens this Mountfield is self propelled (no more pushing!) and has a 15” cutting width, ideal for nipping round your garden The ample 40 litre grass bag will mean it is easy to empty. The poly deck is lightweight but built to last, and painted in the easily recognisable “Mountfield Red” giving you peace of mind safe in the knowledge that you have bought a well known, highly respected brand. The 4-stroke GGP RS100 OHV engine will you years of trouble free gardening. And the 3 height adjusters give you 5 pre-set cutting positions from 25mm to 70mm, so adjusting the height of cut is quick and simple. This is a great little lawnmower, highly efficient, easy to use, and cheap to run. Perfect for those smaller gardens. Buy the Mountfield SP414 Self-Propelled Petrol Lawn Mower from us here at Just Lawnmowers and get a Bottle Engine Oil + Greenthumb Lawn Care Service + FREE Express Delivery for just £209 – unbeatable value! Well we can’t mention budget self propelled lawn mowers without bringing the Efco LR48PK Petrol Lawn Mower into the mix! Buy from us for just £215.00. This lawn mower from Efco is hand pushed and offers a generous cutting width of 46cm /18″ together with a large 60litre capacity grass collector bag. Ideal for medium to large sized lawns. Offering a recoil start and EMAK K 500 OHV engine you will soon be enjoying the efficiency of this budget priced lawn mower. The mulch plug (available as a separate accessory) will convert the lawn mower to mulch-only operation, this means the cuttings are will be shredded and spread evenly over the lawn surface. These shredded cuttings will then decompose rapidly and are transformed into a natural fertiliser that supplies vital organic substances for a healthy lawn. Buy the Efco LR48PK Petrol Lawn Mower from us here at Just Lawnmowers for just £215.99 (RRP £225) – and get free delivery – great value. Our range of budget priced mowers with a cutting width of 18” are aimed at homeowners with medium or larger gardens. The Briggs & Stratton engine is a highly prized commodity amongst some of our customers. Even we are surprised to see it in our budget range. But, it is here no less and we did promise to offer you great value for money didn’t we? The 60 litre grass collecting bag means less trips to the compost heap, and the recoil start makes it easy on those damp mornings to get started. Hand pushed you will have ultimate control and the engine produces less emissions and is quieter than you would have expected, making this lawn mower an all round easy to use and maintain piece of machinery. 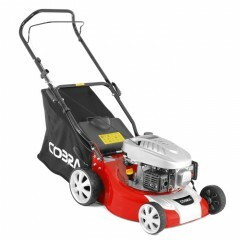 Buy the Cobra M46B Petrol Lawn Mower from us here at Just Lawnmowers and get a Bottle Engine Oil + Free Express Delivery (Usually Next Day) for just £219 – (RRP £239.99) or for even more unbeatable value we are offering our customers the chance to purchase the Cobra M46B Petrol Lawn Mower + DELUXE Cover + Bottle Engine Oil + Free Express Delivery (Usually Next Day) for the amazing price of £229.99 (usually £245.97). Secondly we have the very popular Viking MB 248 T Self-Propelled Petrol Lawn Mower – this lawn mower has come straight from our “hot picks” section on our website and it’s not hard to see why. Reasonably priced at just £269.00 it offers a wealth of features and offers. 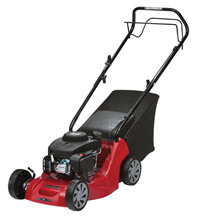 Self propelled and with a generous cutting width of 18” it easily cuts through medium – large lawns in no time at all. It has a 45 litre grass box capacity which may not be as generous as others in the same range but does make emptying it a bit easier! The Briggs & Stratton engine comes highly recommended and you will enjoy peace of mind with the Viking 5 year warranty. 7 cutting heights that are easy to adjust makes this Viking lawn mower very efficient and versatile. The large wheels have high quality ball bearings for easy running. The tread pattern provides better traction and allows for easy cleaning.Easy to transport and store thanks to the easy to fold handles. Petrol driven means you have all the power at your fingertips to cut through whatever mother nature sends your way! This Lawnflite lawnmower looks like a very traditional lawn mower and will last you for years to come. It features a generous 60 litre grass box and an optional mulch kit which just adds to its versatility. 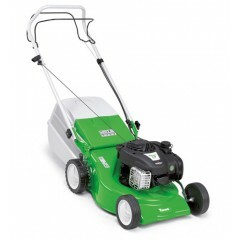 Ideal for medium sized lawns the MTD THorX OHV 35 engine can cope with pretty much any conditions you have to contend with, whether that means a quick trim or cutting down your overgrown lawn. Being hand pushed allows you to easily navigate those bumps and imperfections with less chance of you bumping into walls or garden objects. Six generous cutting heights allow you greater flexibility if you need to cut on slopes or over bumpy and uneven ground. In short this lawn mower is perfect for an imperfect garden! Buy this Lawnflite Smart 46 PO Petrol Lawn Mower from us here at Just Lawnmowers and get free delivery for just £185 (RRP £219). When you have a larger garden to tackle chances are you will need your garden machinery to be more flexible and versatile than ever. This is where our next two lawn mowers come in. They both feature 20-21” cutting widths which are generous but not so big that are no longer useful in smaller spaces. 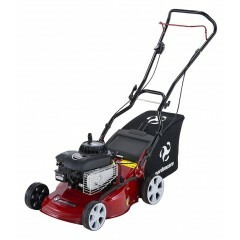 First we have the Efco LR53TK Essential Self-Propelled Petrol Lawn Mower. Priced with us at just £279 with free delivery. The Efco brand may not be as easily recognisable as the rest but they are highly regarded in the industry as they deliver on power, efficiency, reliability and value for money. This lawn mower is no exception. You can choose from 3 cutting options (mulch, cut, discharge) usually saved for the more expensive models. It features a powerful 160cc OHV EMAK engine and is ideal for coping with a larger areas quickly and efficiently. Easy to start and economical to use, this lawn mower pretty much ticks all the boxes and is even self propelled. Let this Efco do the hard work for you! The steel deck is sturdy and made to last, it can take a few knocks and will last you for many years to come, and the single lever height adjuster enables you to change the cutting heights (28-75mm) very quickly and with very little effort, leaving you able to cut the lawn whatever the length. With this EFCO you can tackle anything with very little effort. Buy this Efco LR53TK Essential Self-Propelled Petrol Lawn Mower from us here at Just Lawnmowers for just £279.00 (RRP £349) and get free express delivery. 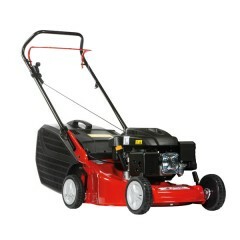 Lastly we have the Mountfield SP53 Self-Propelled Petrol Lawn Mower. You might be asking what this lawnmower is doing in the budget buys of 2017? Well if you buy from us it is still just under that £300 price tag, so, priced at just £299 including free express delivery we think it deserves to be here and just wait and see what you get for your money! Self propelled and featuring a powerful OM55 OHV (160cc) Mountfield engine, along with 5 preset cutting heights, ranging from 27-90mm and a large 60 litre grass collector, you are pretty much ready for anything. This Mountfield SP53 lawn mower is what Mountfield call a “high wheeler”, – it features very rugged and tough 28cm rear wheels, which give the lawnmower a very sturdy look, as well as ensuring a smoother finish, even on more uneven terrain. Built to last this Mountfield is a brand you can trust in, they bring you great quality products at remarkably low prices. The mulching option (mulch plug is included of course) is so efficient you will barely notice the mulched grass clippings on your lawn. The handles fold for easy storage and the machine is easy to start and use. Buy this very popular Mountfield SP53 Self-Propelled Petrol Lawn Mower from us here at Just Lawnmowers for just £299.00 (RRP £349) and get a Bottle of Engine Oil + Greenthumb Lawn Care Service + FREE Express Delivery, but hurry while stocks last! We hope you found this blog useful – as always you can direct any questions at our friendly sales team on 01263 820202.